Oh no. 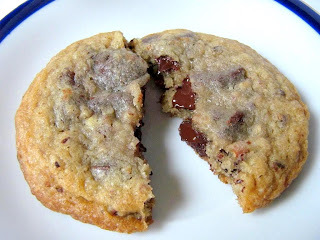 Another chocolate chip cookie recipe. 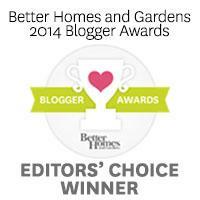 And yet another fruitless effort by a blogger to sound apologetic about that fact. What can I say that hasn't been said already? Chocolate chip cookies, like a pearl necklace, will never fade away into a long forgotten fad. And those of us who blog just can't resist the urge to bake recipe after recipe just to see a difference, no matter how subtle, between each cookie. I know for a fact that this will not be my last c.c. cookie post. There are already several just waiting patiently in the wings for their 15 minutes. One of my favourite blogs is the Smitten Kitchen. I have a feeling that it may be the favourite of just about everyone. 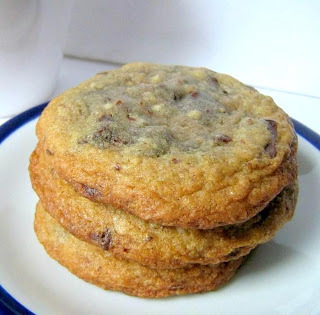 When I read that this recipe topped the list of best chocolate chip cookies I knew I would have to try it, Especially since it was from The Great Book of Chocolate by David Lebovitz. That book is on my holiday wish list! Aside from the fact that these have the perfect c.c. cookie structure (chewy in the middle with a delicate caramel-like crisp at the tips of the edges) they have a secret weapon in the form of toasted, ground pecans. I have used nuts in cookies several times but never had I thought to toast them first. Toasted nuts are an amazing addition to salads so I can't believe that it never crossed my mind to use them in cookie recipes. When nuts are perfectly toasted, their flavour is multiplied by 5 and as long as they don't cross the over done threshold, they acquire a divine ever-so-subtle bitterness. My sister doesn't like nuts, I love them. But these promised to be adored by both parties. Just to be sure, I ran my pecans through a mini-food prep so they would be more inconspicuous. We both gave them a gooey, chocolaty thumbs up. She did not even know that there were sneaky nuts inside until I brought it up. What she did notice was the richer texture and a bitter/sweet taste coming from the dough itself. These should bring happiness to just about every cookie lover in your circle. Adjust the oven rack to the top third of the oven and *preheat to 300F*. Line cookie sheets with parchment paper. In a large bowl, beat the butter and sugars together until smooth. Add the egg, vanilla, and baking Soda. Beat to incorporate. Mix in the flour mixture until all the white streaks have disappeared. Stir in the chopped chocolate and nuts. I ran the cooled, toasted pecans through a mini-food prep. until they were finely ground. Scoop out about 2 Tbsp. of dough for each cookie and place them 4 inches apart on the cookie sheet. Bake for 18 minutes or until pale, golden brown. My cookies were done after 15 minutes so keep checking on them. Remove from oven and cool on a wire rack. These are fabulous while still warm but more complex and 'dense' on the following day. This is so funny! I just posted a CCC recipe today, too. This one, however, looks INCREDIBLY delicious. I guess I'll have to add it my list of cookies to try ASAP. I never get tired of trying Chocolate Chip Cookies! Thanks for sharing this one. 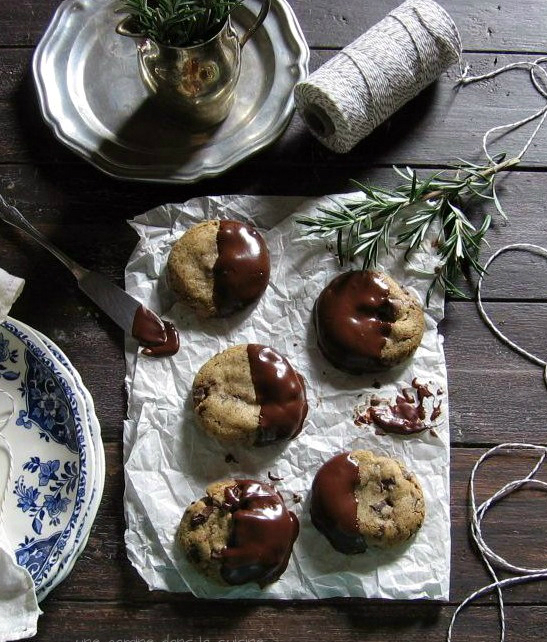 This cookie recipe is on my wait list too and sounds fantastic. Just like you, I can't wait to try (and post) yet another CCC recipe... They are definite crowd pleasers! After looking at your post i got a craving so bad! i had to try. they were INCREDIBLE! perfect. chewy, crisp on the edges soft center. delicious. Hi Mariam, I'm so glad you liked these as much as I did! I'm not even sure how I wound up stumbling onto your page, but your recipes are fantastic! 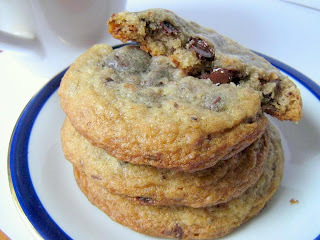 The toasted pecan chocolate chip cookie is simply *the* best I have ever had. I did tweak the recipe ever so slightly the last few times I made it and found the perfect combination: I pulse the toasted pecans in a food processor so they are less like flour, but still quite ground down; substitute bitter sweet chocolate for the semi sweet and also pulse into much smaller pieces. I now use only dark brown sugar and coarse kosher salt-and add 1/4 to 1/2 teaspoon extra of the salt (the little extra bite of salt every now and then is incredible!!). The refrigeration process is key to this recipe, for me. The longer you chill, the better the dough and cooking process is. Rolled into 1.5 inch to 2 inch balls and baked for 20 mins exactly results in the most perfect cookie I've ever made. Thank you for the recipe!!! Thanks for visiting! I'm so happy to hear how recipes turned out for people! !